Charles Heidsieck is one of the great houses of Champagne and makes a medium bodied, complex, often nutty and well aged tasting Champagnes. Their quality has gone from pretty good to outstanding in the past 2 decades. They are located in Reims and have one of the most impressive (2000 year old) Gallo-Roman chalk cellars well worth visiting, as well as being a state of the art wine making operation (make reservations first if visiting). The original Heidsieck was started way back in 1785 by Florenz-Ludwig Heidsieck. The house was split among his nephews into three separate house including Heidsieck & Co Monopole in 1834, Piper-Heidsieck in 1834, and Charles Heidsieck a bit later in 1851. Charles Heidsieck is now owned by French Luxury Firm Société Européenne de Participations Industrielles (EPI). The sale of Charles and Piper-Heidsieck, as well as the US based Piper Sonoma brand, from Rémy Cointreau to EPI was announced in June of 2011. Rémy Cointreau's Champagne division was losing money with the global economic conditions, and many Champagne industry insiders have commented favorably on the sale and purchase - it seems to be a good thing. Charles Camille Heidsieck was known as "Champagne Charlie" and was a colorful figure that did a lot to popularize Champagne in the US. He was the son of equally colorful Charles-Henri Heidsieck, one of the three nephews of original Heidsieck founder Florenz-Ludwig Heidsieck who allegedly rode into Moscow ahead of Napoleon's troops on a white horse ready to sell Champagne to whoever won the battle. In 1852 Charles first visited the US and decided that New England and New York held significant promise and he subsequently had enormous success and record sales of Champagne. When he visited 5 years later he was treated like a celebrity with massive media coverage and enormous parties held in his honor. Unfortunately the US Civil War reversed his fortunes, and he even spent 5 1/2 months in a Union prison, under suspicion of spying. His fortunes were reversed shortly afterwards again (someone gave him a third of Denver, really!) and you can read about it at Wikipedia. There is also a 1989 French-Canadian TV Series about his life starring Hugh Grant called "Champagne Charlie." Their wines are stored for a minimum of 3-6 years in the massive and deep (25 meter) chalk cellars which have a constant cool temperature and humidity year round, and stored a minimum of 2-6 months after bottling as well. Charles Heidsieck Brut Reserve - This non vintage wine makes up most of their sales by far, and is notable because the amount of "reserve wines" (the older wines mixed into the blend) is over 1/3, a very high percentage. More common is 10 to 25% for other Champagne houses. It took off in 1992 with enormously improved quality as that is the year they switched to the much higher percentage of reserve wines. They also list the date of disgorgement, or bottling, on the back on the bottle, a practice I strongly wish other producers would adopt! This wine is approximately 1/3 Pinot Noir, Pinot Meunier, and Chardonnay. Charles Heidsieck Rose Reserve - This is the most recent addition to their lineup, a Non Vintage Rose, and about twice the price of the Brut Reserve. Charles Heidsieck Brut Vintage - Their entry level vintage wine, a definite step up, with slightly more Chardonnay than their Brut Reserve. Charles Heidsieck Blanc de Millenaires Vintage - A Blanc de blancs, 100% Chardonnay and a stunner, with grapes only from the villages of and Avize, Cramant, Le Mesnil-sur-Oger (often just called Le Mesnil), Oger and Vertus. Only made 2 or 3 times per decade. Charles Heidsieck Rose Vintage - Their Vintage Rose, a lovely wine they have been making for many years. 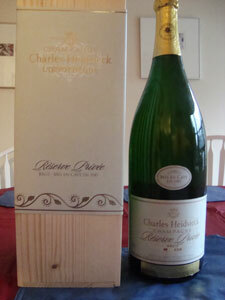 Charles Heidsieck Collection "Champagne Charlie" - Older vintage wines direct from their cellars. They also make a "Multivintage" or MV wine - tasting note below. 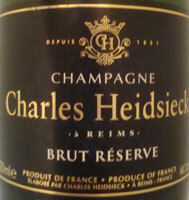 Tasting Note: Charles Heidsieck Brut Reserve - Disgorged in 2109, tasted April 2012. Rated B+ on the A to F scale. The nose is light and airy, with apple, a backdrop of citrus, and a little fresh bread. On the palate a nice bold taste, medium weight and aristocratic mouthfeel. Rich yet light on its feet. The older reserve wines they use add to the weight and width of this wine. This wine was intended to be released for the millennium celebrations, but wasn't. Released in Jeroboam (3 Liter) bottles only, it is a multivintage wine that is 60% 1986 with reserve wines dating back to the 70s and the wines average 29 years old. It spent 22 years, including 12 on its lees, in Heidsieck's cellars. The Rare Wine Company believes it can age effortlessly for 3+ decades, and based on its condition and how it improved on day 2, I believe it! Nose - Hard crusted bread, chalk, muted yet very giving orange tones. On the palate, there was very tart apple which most people enjoyed a lot. I found it a bit too tart, yet still very enjoyable on day 1 but by day 2 it was better - see below. Minerals. Very long with a hint of sherry. A bit of orange in the background. This sat opened, half drunk, at room temperature for about 12 hours, and then was placed outside at maybe 35 degrees Fahrenheit very loosely covered by a plastic bag. On day two, it was simply much better to my palate. The apple was less tart, the wine was better integrated, and there was plenty of fizz left as well. It was certainly enjoyable on day 1 but much better on day 2!